-What was the year of the accident? -Which car and driver was involved? -When and where did the accident occur? -What was the impact of the accident on that year's Vanderbilt Cup Race? Robertson broke his collar bone and Warren broke both ribs. Both the team and the Apperson were unable to compete in the American Trial. 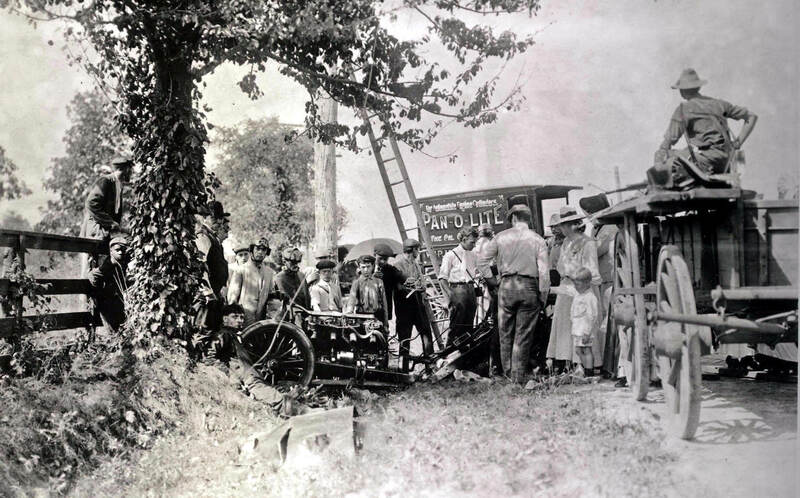 This accident and the death of a spectator during the 1906 Vanderbilt Cup Race reinforced the need for a private speedway for the races and eventually the creation of the Long Island Motor Parkway. Congrats to this week's Mystery Foto dectectives: Jean-Yves Lassaux (who also provided the three above images), Arejan Bos, Art K., and Greg Oreiro (who found my earlier Pickering photo of the accident). Ted, better luck next week!! If you have a suggested Mystery Foto, please send me a jpeg at Howard@kroplick.com . 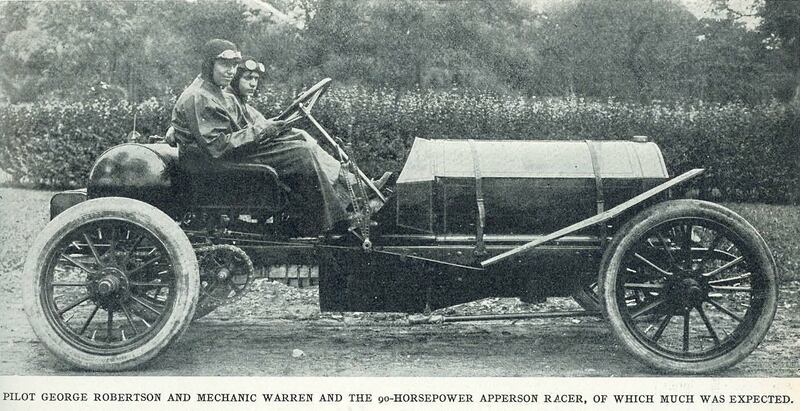 "Pilot George Robertson and Mechanic Warren and the 90-Horsepower Apperson Racer, Of Which Much Was Expected." Oh Howard !! I recognize where it is,but can’t place it,any hints,I did some searching,but nothing looks like it. PLEASE!!! It looks like the Apperson car that George Robertson wrapped around a pole on Old Westbury Road in Roslyn during the 9/19/06 American Elimination Trial, thus “eliminating” him from competing for the Vanderbilt Cup three days later. 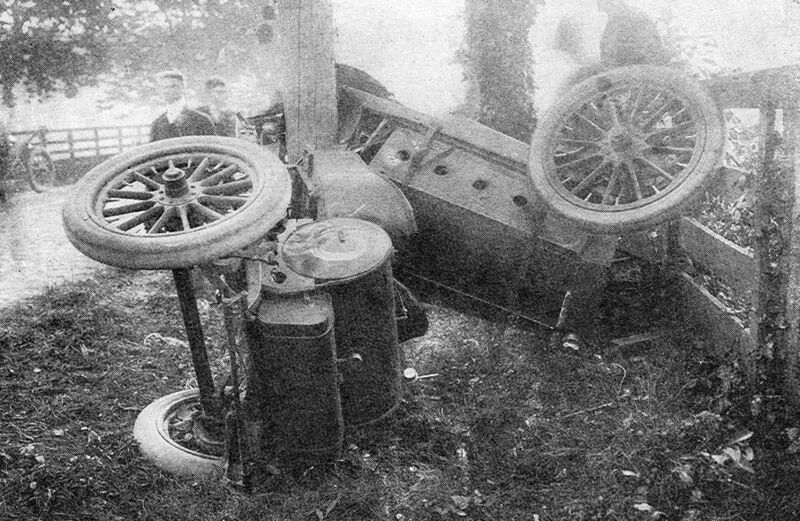 These are the remnants of the Apperson, which crashed at Hairpin Turn on Old Westbury Road in Roslyn during practice for the American Elimination Trials of the 1906 Vanderbilt Cup race on September 19th, 3 days before the actual race. Whether a steering linkage broke or a tire blew is not clear, but the car swerved and struck into a tree. 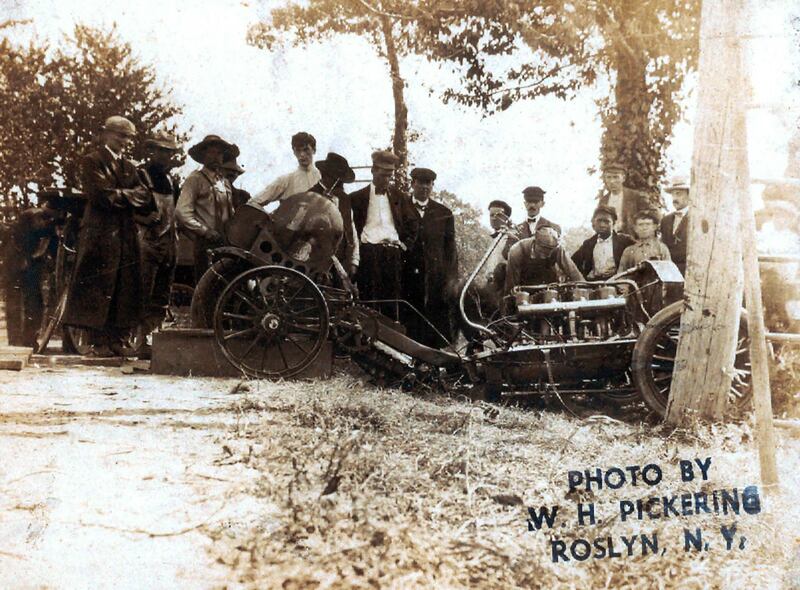 It seems a miracle that driver Robertson and his mechanic Arthur Warren were only slightly hurt during this accident. The blow must have been tremendous. Robertson only broke a collar bone, Warren two ribs! I couldn’t find any effect on the Vanderbilt Cup race other than that Robertson and his Apperson, who belonged to the favourites, weren’t able to qualify for the main event (understandably). Robertson couldn’t compete in the 1906 race, having to wait until 1908 to win. Here is my answer with three pictures. George Robertson in Apperson 80hp. His mechanic was Arthur Warren, son of Louis H. Warren the man who taught future champion David L. Bruce-Brown how to drive. Both man were seriously injured but later recovered. 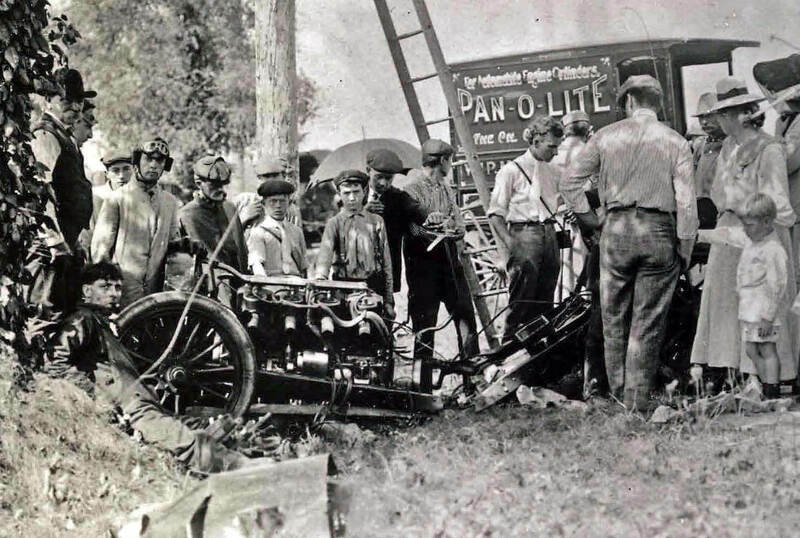 September 19, 1906 during practice for the elimination trial, on Westbury Road after the Hairpin Turn of Old Westbury. 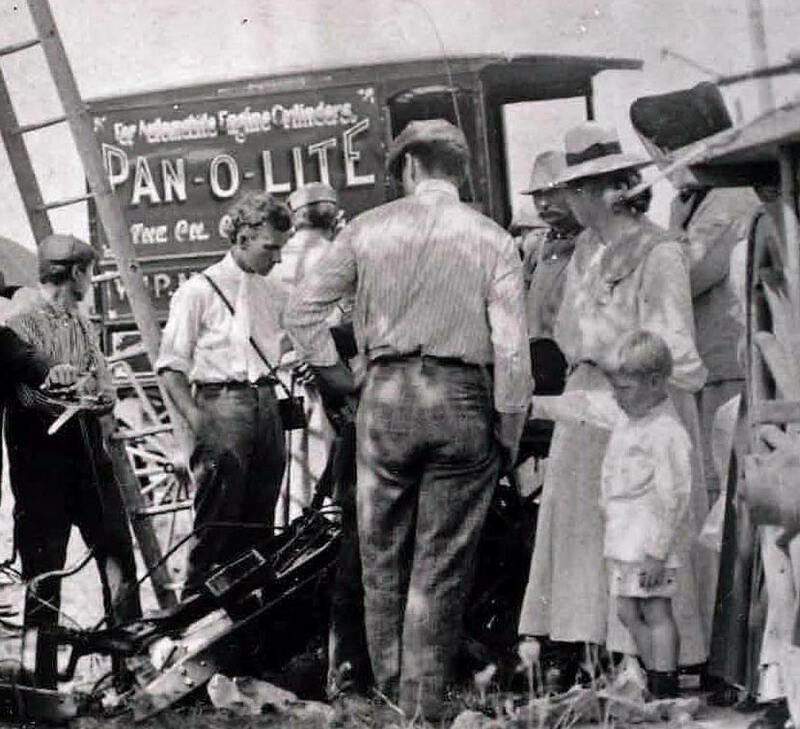 -What was the impact of the accident on that year’s Vanderbilt Cup Race? 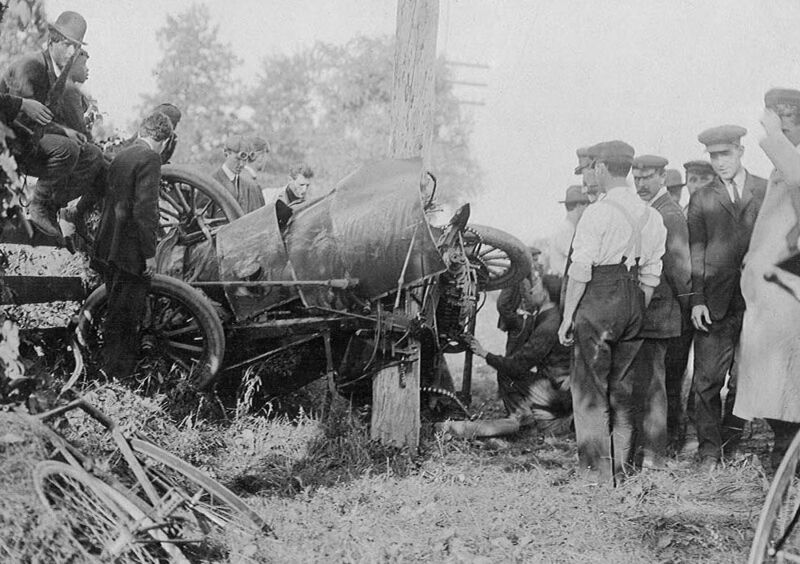 This accident, the death of a spectator during the race (Kurt L. Gruner hit by Elliott F. Shepard Jr.‘s Hotchkiss on lap 6) and the bad press that follows, generate the creation of the Automobile Highway Association later become the Long Island Motor Parkway Incorporation, with the project of building the first American road especially for automobile. Problems with estate private owners delayed the construction and the 1907 race was cancelled. It’s possible the missing seat and covers may have been needed to be removed to get it off the pole, but the tire still seems a little puzzling. Any other speculations on the missing parts and tire? Could it be an indication of a loss of steering linkage as Ariejan suggested in his post? So it was neither the linkage nor a tire! Instead, it was driver error for getting too close to road obstacles! Surprising for a driver that ‘Much Was Expected’!